Microsoft Announcing Azure Time Series Insights, a fully managed analytics, storage, and visualization service that makes it incredibly simple to interactively and instantly explore and analyze billions of events from sources such as Internet of Things (IoT). Time Series Insights gives you a near real time global view of your data across various event sources and lets you quickly validate IoT solutions and avoid costly downtime of mission-critical devices. It helps you discover hidden trends, spot anomalies, conduct root-cause analysis in near real-time, all without writing a single line of code through its simple and intuitive user experience. Additionally, it provides rich API’s to enable you to integrate its powerful capabilities in your own existing workflow or application. With built-in integration to Azure IoT Hub and Azure Event Hubs, customers can get started with Time Series Insights in minutes. Just enter your IoT Hub or Event Hub configuration information through the Azure Portal, and Time Series Insights connects and starts pulling and storing real-time data from it within a minute. This service is schema adaptive, which means that you do not have to do any data preparation to start deriving insights. This enables you to explore, compare, and correlate a variety of sensors seamlessly. It provides a very intuitive user experience that enables you to view, explore, and drill down into various granularities of data, down to specific events. 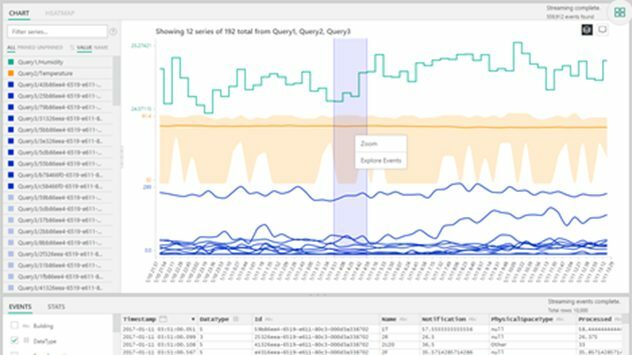 It also provides SQL-like filters and aggregates, ability to construct, visualize, compare, and overlay various time series patterns, heat maps, and the ability to save and share queries. Azure Time Series Insights extends the broad portfolio of Azure IoT services, such as Azure IoT Hub, Azure Stream Analytics, Azure Machine Learning and various other services to help customers unlock deep insights from their IoT solution. Currently, Time Series Insight is available in US West, US East, EU West, and EU North regions.